Kelana is a beautiful 16 m long vessel inspired by the traditional Indonesian boat : the Phinisis. Entirely made of wood, Kelana have been entirely refurbished in 2017 to present a modern, design and practical boat to offer the most amazing experience possible. With 16 m Kelana might be one of the smallest boat of the Indonesian fleet but it is one of the best designed. With 3 cabins, 2 wooden decks, 1 indoor living area and 1 dining area at the stern, Kelana offers a vast amount of space to its guests. The attention to details and the lovely decoration makes it a very pleasant boat to sail and discover the magnificent Komodo national park. Kelana has 3 wooden cabins decorated with a mix of Indonesian touches and modern design making the cabins a very pleasant and cozy place to sleep in. 1 double bed and 1 single beds cabin with 2 bunk beds are located below the main deck. All have en-suite bathrooms with wardrobes and air-conditioning. 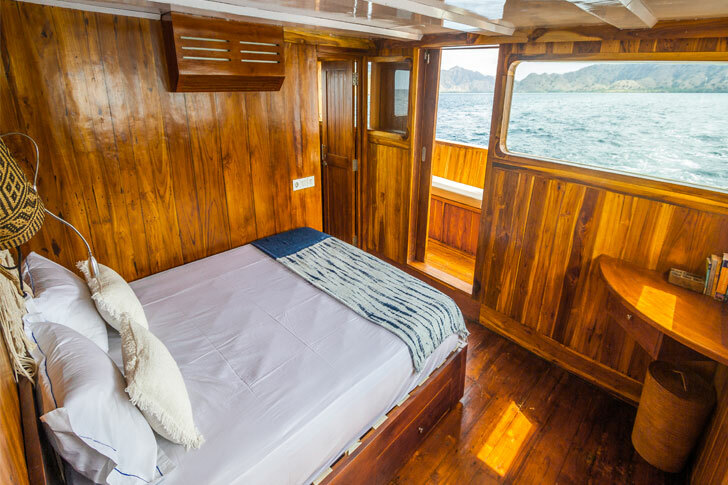 On the upper deck the master cabin has a double bed with en-suite bathroom, air-conditioning and a panoramic view on the breathtaking landscapes that will surround you during your cruise in Komodo national park. In total Kelana can accommodate 6 passengers in total comfort. Kelana was built to offer the best sailing experience possible to its guests. 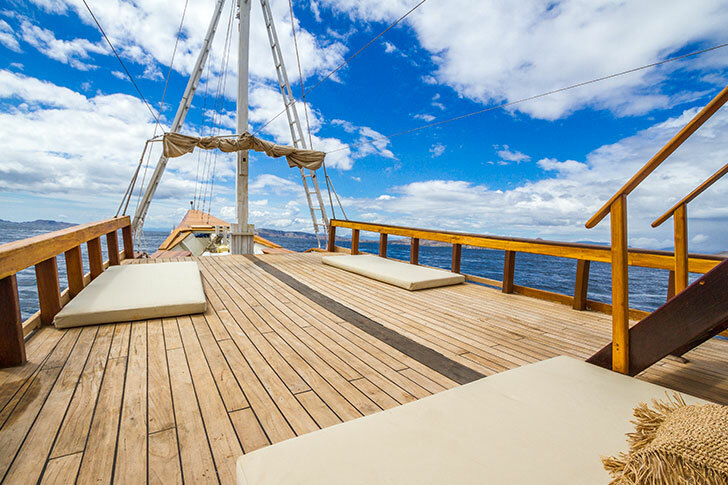 2 wide wooden decks entirely finished in teak with loungers and beanbags are perfect places to chill and rest while enjoying the fabulous landscapes of Komodo scrolling in front of your eyes. An indoor living area with air conditioning is located on the main deck if you want to protect you from the heat and sun. A the stern there is a dining area where the very professional and discreet crew will serve you your meals cooked with local products! A great boat to spend memorable vacation in Komodo national park.